Wednesday I got to go to a Jays Game with John, my dad, my sister and her boyfriend. 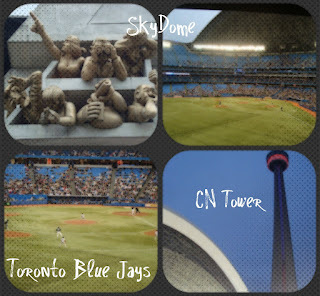 It was such a fun night because I love going to baseball games and, on top of that, the Jays won! Yesterday I biked to work, then got my hair done, then came home and cleaned, cleaned, cleaned. Laundry, dishes, cat litter, picking up clutter...A very productive day. I have a few more recipes I want to try out this weekend but they will have to wait for the weekend because today I'm all over the place. Interview in the morning, class this afternoon (first day back! Eep! ), then work in the evening. But then it's the weekend! I was toying with an idea for a challenge in my head for the past few days, wondering if it's actually possible. I have a bad habit of spending money pretty freely, whether it be shopping, grabbing a coffee, buying lunch, magazines, etc. I need to be better about saving, especially since I have a wedding to pay for (and OSAP to pay off next spring too). Here's where I challenge myself. Starting this Sunday, I'm challenging myself to not spend ANY money for an entire week. It's like setting myself up for failure. But I think I can at least make it Monday to Friday. Now that I've paid for my hair there aren't many other things I need to worry about. Except John's sister's birthday (Sunday) (solution? Buy her present tomorrow before the self-imposed ban on spending begins) and an Algonquin camping trip next weekend. Algonquin will be good because out in the wilderness you can't really spend much money unless you want to throw it at various woodland creatures. Or unless you're like me and go into the store right by the canoe launch and buy gloves (in my defense I bought them because I was freezing), warm socks (I don't regret that purchase either), a rain-proof poncho (that one wasn't really necessary...), and candy. Actually maybe I should postpone this challenge until after Algonquin. Not because I'm going to go buy all new camping items but rather because we'll need to buy food (and alcohol) to take with us into the interior. John has been fixing up a canoe so we're saving money by not renting one. And we have our own paddles and lifejackets. Once I set foot in Algonquin I will start the challenge. If I'm successful I'll try and allot one week a month to spending no money. *Bills and rent are exempt from this but I'll try and plan around important dates. 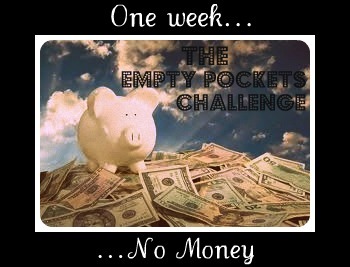 The challenge begins September 17th - September 24th. Now, if you want to spend some money on good things I'm going to direct you to two very worthy causes. 1. My cousin is participating in the Scotiabank AIDS Walk for Life. If this is a cause that, like me, you think is incredibly important, please support her here. 2. My friend, and one of John's groomsmen, is raising money to participate in the Ride To Conquer Cancer. You can donate to this very worthy cause here! We need to get him to $3,500! In other news - I finally got my placement for clinical! I will be in the Cardio/Vascular surgery ICU! I'm very excited as I feel this unit will challenge me and will provide many opportunities to learn a vast array of skills, both practical and human. I'm nervous too, as I've only been in an ICU once before when my grandfather was dying and it was a hard experience. I can guarantee there will be tears this semester but I'm looking forward to this placement and I know I will walk off that unit in December as a better person. In more Martha-esque news, I tried out a new recipe for dinner and it's a keeper! I've made a few changes to it to make it taste a bit better and I will post that tomorrow!